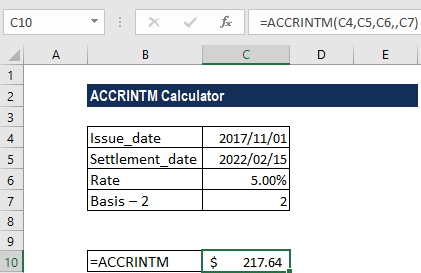 What is the ACCRINTM Function? The ACCRINTM Function is a Financial functionFunctionsList of the most important Excel functions for financial analysts. This cheat sheet covers 100s of functions that are critical to know as an Excel analyst. 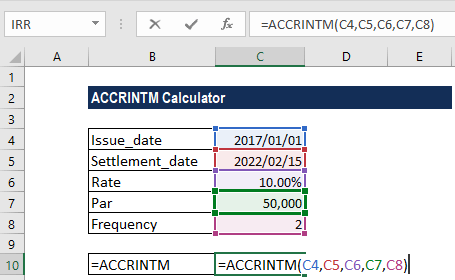 ACCRINTM was introduced in MS Excel 2007 and hence not available in earlier versions. When we invest in an interest-paying securityPublic SecuritiesPublic securities, or marketable securities, are investments that are openly or easily traded in a market. These securities are either equity or debt-based. An equity security is an investment based on the equity of a company. A debt security is an investment based on the debt of a company or entity, we will receive interest payments that are paid either at once or periodically. The function will calculate the accrued interest for a security that pays interest on maturity. 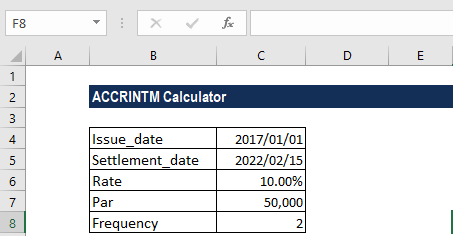 MS Excel provides two functions for calculating accrued interest: ACCRINT and ACCRINTM. ACCRINT helps calculate the interest that is paid by issuer periodically. On the other hand, ACCRINTM calculates the interest that is paid at the maturity, or the lump sum interest when a security expires. Issue (required argument) – It is the security’s issue date. If it is not an integer, it will be truncated. Settlement (required argument) – It is the security’s maturity date, which is when the security expires. Par (required argument) – It is the security’s par value. If omitted, then ACCRINTM function will take the par value as $1,000. 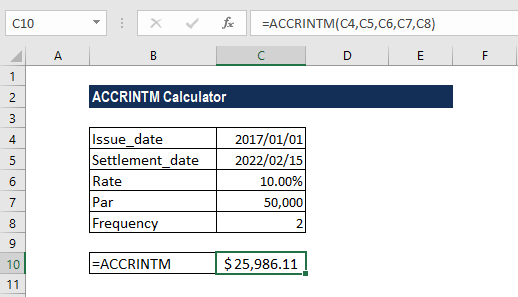 How to use the ACCRINTM Function in Excel? 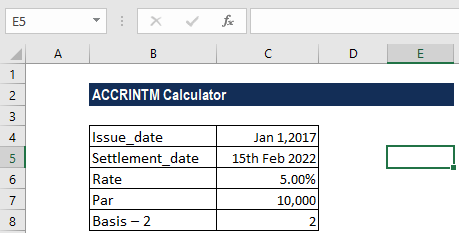 Let’s now see how we can use the DATE function along with ACCRINTM to find out the interest payable. The reason we use the DATE function is that the dates given are not in date format. 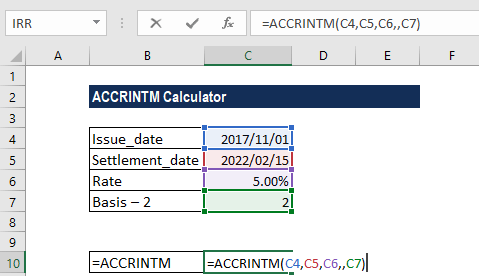 We can use DATE along with ACCRINT to get the interest receivable on maturity. The given rate argument is ≤ 0 or the given [par] argument is ≤ 0. The provided issue argument is greater than or equal to the settlement date. For example, when we provide =ACCRINTM(“1/10/2017″,”1/7/2017”,0.05,,1). The given basis argument is not equal to 0, 1, 2, 3 or 4. For example, when we provide =ACCRINTM(“1/1/2017″,”1/7/2017”,0.05,10000,5). The given issue or settlement arguments are not valid dates. If we attempt to input the date arguments as text, MS Excel may interpret them incorrectly, due to different date systems or date interpretation settings.